(Nanowerk News) The Indian Ocean contains vast fisheries and mineral resources that are of strategic importance to both Australia and India. It also plays a direct role in driving the climates of its surrounding regions – home to more than 16 per cent of the world's population. 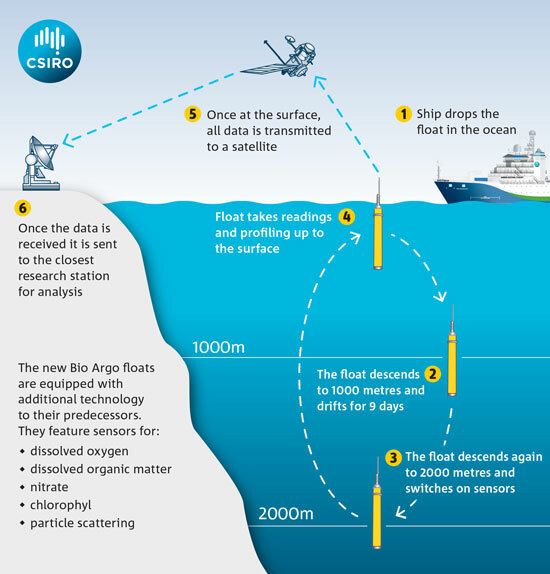 The new 'Bio Argo' floats, to be launched in mid 2014, will enhance the already successful Argo float technology to measure large-scale changes in the chemistry and biology of marine ecosystems below the Indian Ocean's surface. An infographic on how data is collected from an Argo float. CSIRO's Dr Nick Hardman-Mountford said the pilot project, led by CSIRO in collaboration with the Indian National Institute of Oceanography (CSIR-NIO) and the Indian National Centre for Ocean Information Services, will improve our understanding of cause and effect in the Indian Ocean's climate and ecosystems. "By studying the Indian Ocean in this detail, we can investigate the origin and impact of marine heatwaves like the one that devastated the coral reefs and fisheries off north Western Australian in 2011 – and improve our prediction of them in the future," Dr Hardman-Mountford said. CSIR-NIO Director, Dr Wajih Naqvi, said the novel technological innovation will give researchers from both countries a new understanding of the Indian Ocean. "We expect the technology being utilised in this project to provide new insights into the biogeochemistry of the Indian Ocean and how it is being impacted by human activities," Dr Naqvi said. Argo robotic floats are the only means to collect the subsurface observations needed to provide year-round, near real-time information on ocean conditions. Dr Susan Wijffels talks about how they work. The proposed advances in ocean observation, ecosystem understanding and resources management, which will benefit the entire Indian Ocean Rim, can only occur through collaboration between India and Australia. Dr Nick D'Adamo, Head of the Perth Programme Office supporting UNESCO's Intergovernmental Oceanographic Commission (IOC) – a partner in the project – praised the collaborative nature of the project. "By combining the research capabilities of India and Australia we will see an improved ability to predict and prepare for global climate change, as well as better conservation of marine biodiversity," Dr D'Adamo said. The $1 million project was funded in part by the Australian Government under the Australia-India Strategic Research Fund.